You are invited to be a part of Style Weekly’s RVA Earth Day April 26th! Do something good for our earth and city this year by volunteering. We need people of all ages to help with kids activities, setup, pouring beer and checking IDs. 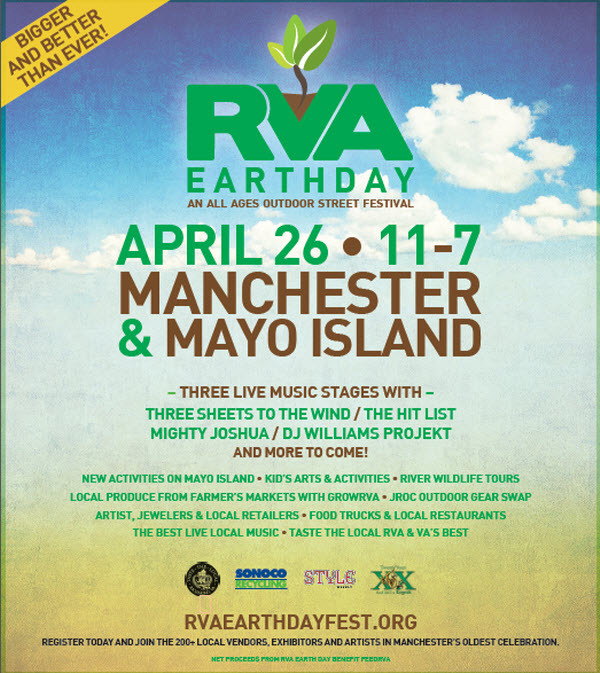 Sign up today by clicking on the volunteer link at http://rvaearthdayfest.org. This event benefits FeedRVA, an organization that helps our communities grow, buy, sell and eat healthy food. Sign up by April 10th and you will be put in a drawing for tickets to the Squirrels, CineBistro, or the Chili Cook Off! Next Next post: RVA First Fridays tomorrow night!